This weekend, cold though it was, the sky desisted in dropping precipitation, so out we went to work in the yard. 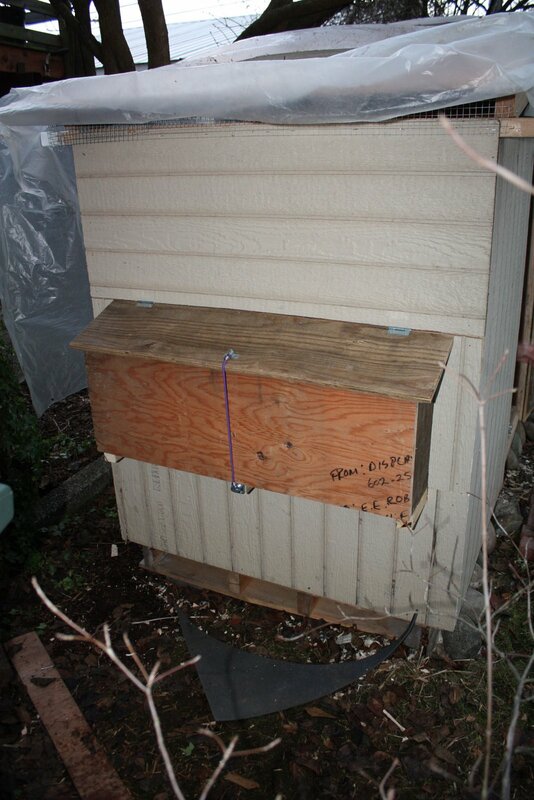 Scott attacked shrubs and trees with pruning shears and I placed nest boxes in the chicken coop. The chickens won’t lay eggs for another month or more, but we wanted the nest boxes to be familiar by the time they do lay eggs – with the hope that they will use them!! I built the boxes in the garage in November from scrap lumber. Following advice in the wealth of chicken literature, I made them 12″ deep and wide and 14″ tall with a 3″ lip, and I placed them 18″ off the coop floor. I decided to make the boxes easily accessible from the outside by jutting them out and sloping the lid. 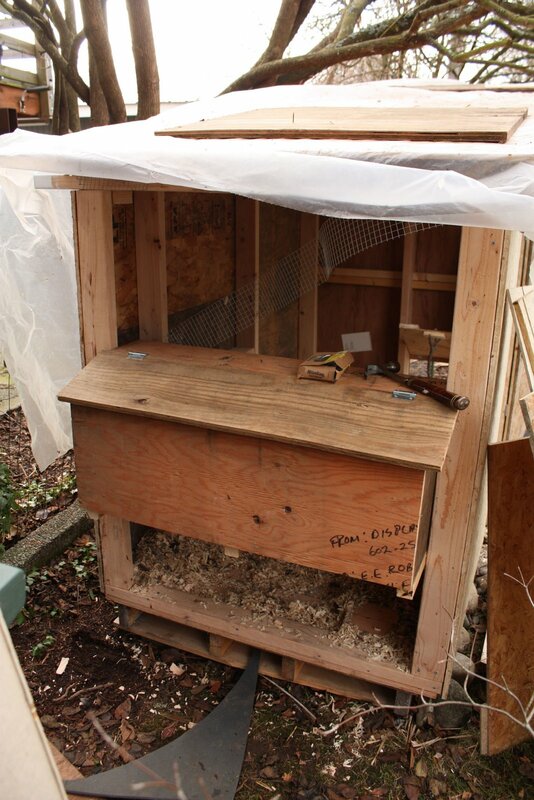 Off came the back paneling of the coop, in went supports to cantilever the boxes beyond the coop frame. 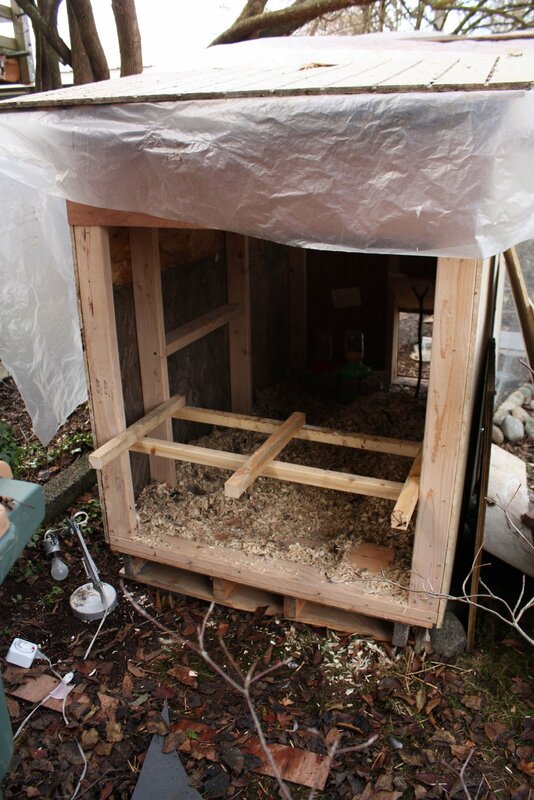 Boxes went in after some chiseling to mediate for the coop not being perfectly square (…hey, I’m not a professional). New paneling cut to fit, and she looked pretty good! 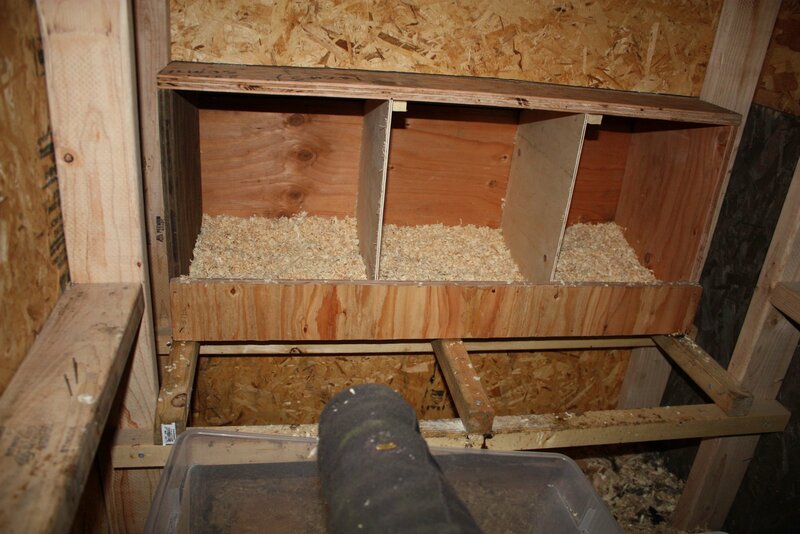 This entry was posted in chicken coop / run, DIY, eggs, nest boxes. Bookmark the permalink. 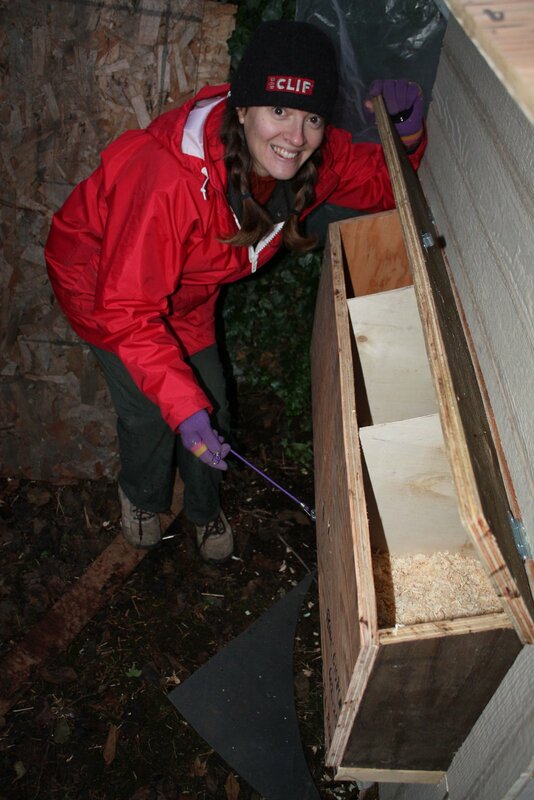 Nice job on the nest boxes. I’ve found that to get chickens started laying eggs a couple of golfballs are pretty handy. Chickens can count, but only three quantities with respect to eggs. “none”, “some” and “a dozen”So none means that someone stole your eggs, so you should look for/lay some somewhere else. “some” means you are amassing eggs towards “a dozen” or so, when you start to sit on them and stop laying eggs until your current clutch hatches. Can I ask a work-related question? Is there anything in road runoff that I should be concerned about with animals? Should I be concerned about runoff from the freeway near my farm? Hey, cool, a comment from someone who is not my sister! Hi Bruce. Funny you mention the fake eggs, I’m signed on right now to make a post about some fake eggs I made for just that purpose! Your work-related question is interesting. Mostly I work with aquatic animals whose sensitivity to contaminants in road runoff is related to them being in constant contact (both inside and outside their bodies) with the nasties (mostly metals and fossil-fuel derived hydrocarbons aka polycyclic aromatic hydrocarbons aka PAHs). Terrestrial animals are going to be much less susceptible to the detrimental effects of these contaminants. That being said, there are definitely health risks for terrestrial animals related to proximity to freeways, though these tend to be airborne contaminants – including dust coated with PAHs which cause respiratory and heart conditions. Yay. I wouldn’t be worried about the health of your animals related to the water runoff per se. Looking forward to your turkey class this fall! Good post. I learn something atndiiodal challenging on different blogs every day. It is going to usually be stimulating to study content from other writers and practice a little something from their retailer. I’d favor to use some together with the content material on my weblog no matter whether you do not mind. Natually I’ll provide you with a link in your web weblog. Many thanks for sharing.